Cairn Applications has just signed a 2 year lease on a new data center! This new facility gives Cairn significantly greater computing resources and will enable us to provide better performance to all our clients! In addition, web application clients can now be hosted on private servers within the data center. This will significantly impove application performance by providing dedicated database instances, CPU and RAM for resource intensive projects..
We look forward to providing all of our clients with improved performance in the comming months as we migrate the platform to the new data center. The US Senate on Monday passed the Marketplace Fairness Act which seeks to empower states and territories to collect sales and use taxes on products purchased over the internet and shipped into their tax jurisdictions. Section 2, subsection C of the Senate bill exempts remote sellers with "...gross annual receipts in total remote sales in the United Stated in the preceding calendar year..." of less than $1 million. There has been some discussion that this number will be raised to $10 million, though the text bill does not reflect that. Will I have to collect, file, and remit taxes in all 50 states, the District of Columbia and the territories? Maybe. States are not obligated to collect sales taxes from remote sellers. Section 2 of the act states that "A State may exercise authority under this Act beginning 90 days after the State publishes notice.." of their intent to do so. Non-member states ( D.C. and the territories ) are forced to wait 6 months before they can begin to enforce the Act. Several states do not have sales taxes, and given that this is optional on the part of those that do, the number of states that require collection and remitting will change over time. How can I deal with 9600+ separate tax rules? They must "...provide a uniform sales and use tax base among the state and local taxing jurisdictions within the State.." That means that each will effectively have a homogeneous taxing algorithm. Provide ( free of charge ) software to calculate tax liability for each transaction in real time this software must also be capable of filing sales tax returns. Provide a mechanism for certifying software providers and keeping them informed of rate changes in a timely manner. What if there are mistakes? The Act protects sellers from liability incurred due to errors made by certified software providers. It also protects certified software providers from bad information given them by the remote sellers. Many of you will be aware that Cairn has been building a new proprietary E Commerce solution called myStore. The Marketplace Fairness Act has been in the works during most of the this development cycle and as such we have built in a tax calculation module. At present, the module is little more than a placeholder, given how little is known about this Act and it's viability. This tax module will be activated by a user option on myStore and it looks like periodic ( monthly, yearly ) reviews of the trailing 12 months sales will be necessary in order to tease out our client's small seller exception status. While the Bill did pass the Senate on Monday, it has yet pass in the House of Representatives. Speaker of the House John Boenher is adamantly apposed to the Bill as are a number of representatives. Mr. DeRosa was clear that we are a long way from this bill becoming law. Should the Marketplace Fairness Act become law, Cairn Applications will be seeking certification as a software provider in order to give our customers' customers the best possible e commerce experience with the least hassle over taxes. Come to the Made In NH Expo and get 3 months free support! 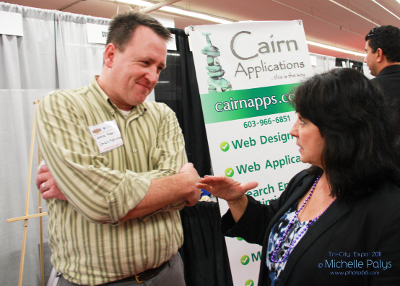 Cairn Applications is going to the Made In New Hampshire Expo at the Radisson in Manchester on April 5th, 6th, and 7th! We are looking forward to a great show. The Made In New Hampshire Expo features products and services from all over the Granite State. If your company is in the market for a new web site or web application, now is the time. New clients we meet at the show will receive 3 months of free support when they sign with Cairn Applications. You get access to all the tools, all the support, and all the analysis free for the first three months! The Westboro Baptist Church, an extremely controversial right wing activist group infamous for vocal and outrageous protests against homosexuals, and anyone else who strays from their narrow and rather literal view of Old Testament writings, is/was planning a demonstration in response to the Sandy Hook incident in Connecticut. The protest was being planned for Sunday and was apparently going applaud the massacre as some kind of demonstration of divine intervention and moral correction. To be clear, I could do ten pages on my remorse for what happened in Connecticut, and ten more on my disgust for the Westboro Baptist Church people. But that is not the point I want to make here. Anonymous is group of anonymous cyber terrorists that acts unilaterally against people and organizations that they deem to be worthy of their wrath, namely those they perceive as doing evil. The group made headlines in September by attacking GoDaddy's DNS systems and bringing a large portion of the internet to a halt for several hours. That attack was in response to GoDaddy's role in what the group sees as web censorship. So today, Anonymous is attacking the Westboro Baptist Church ( WBC ) by getting people to mail them hate mail, publishing their credit card and phone numbers on the internet, having pizzas delivered to them and causing general mayhem. Most notably, the group hacked into the WBC Twitter account, changing the background, and messages. They also published an ominous video threatening the Westboro Baptist Church. To their credit, Anonymous has a super-hero like feel to them, unilaterally acting extra legally to right wrongs. It is all rather intoxicating, for now. But what if the group's "moral compass" starts to drift? Attrition, intoxicating power, and no end of wrongs, or perceived wrongs, to right could make this group a significant force for good or evil. But, the fact remains that Twitter, one of the world's most popular web sites and a prolific vehicle for non-commercial communication, was illegally compromised to serve a political agenda. That agenda is under the direction of no legal authority, it is unregulated, and while most people likely feel that Anonymous' efforts are righteous, there is no guarantee that this will always be the case. Yes, they are acting the part of the super hero. For now. But just as the events in Connecticut have sparked a national conversation on gun violence, this illegal compromise of Twitter should lead to a national conversation about how the internet fits into the legal framework that we choose to embrace. You cannot petition a vigilante for redress of grievances and the First Amendment applies to everyone, even when you don't like what they have to say. Here is what is known. GoDaddy, the largest Hosting and Domain Registrar in the world, came under attack this afternoon. The attack appears to have been perpetrated by the cyber terrorist group Anonymous. There is some information on the group's Twitter feed that suggests that the attack was the work of only one member of the organization. Not that it matters a great deal. The attack targeted GoDaddy's DNS System which is responsible for translating domain names such as www.yourdomain.com to an IP address such as 111.222.333.444. This is a critical first step in any web inquiry. This was a Distributed Denial Of Service ( DDOS ) attack. In simple terms, the attacker spreads a virus to thousands, perhaps millions, of unsuspecting computers. At some predetermined moment, or in response to some condition, all these computers "wake up" and start making simultaneous requests of a single resource, in this case the GoDaddy DNS System. The large volume of simultaneous requests from all corners of the globe simply overwhelms the system, thereby blocking ( denying ) legitimate traffic. The motivation given for the attack was some vague claim about GoDaddy promoting web censorship. This is just noise. Likely this was done simply to show that it could be done. This is a common motive. The attack lasted from around 3:00pm to nearly 6:00pm Eastern time on 9/10/2012, one day shy of the 11th anniversary of the 9/11 attacks. Client Data was not affected by the attack. It is important to note that that Cairn's clients are not hosted at GoDaddy, so no data was at risk during the attack. Cairn does, however, use GoDaddy to register domain names. Their DNS servers are critical to the operation of many of our client's sites. As a result, many Cairn clients were affected by the attack. Should we have our own DNS Service? Our knee jerk reaction is to wonder about the feasibility, expense, benefits and drawbacks of operating an independent DNS look up system. GoDaddy has been a reliable provider up to now and to their credit, they appear to have gotten the situation in hand fairly quickly. Should this happen again, however, our wondering will become more urgent. Cairn is pleased to anounce the launch of LAFlipped.com, a web application built to take advantage of the Flipped Classroom model of delivering instruction. This project was built gratis for the Language Aarts department at Auburn Village School, in Aubiurn, New Hampshire. We have secured our booth for the Tri City Expo at the Radisson Hotel Expo Center in Manchester, NH. The event will be on Thursday July 20th from 3:00 to 7:00pm. If you have thinking about a new web site or web application for your business, then stop by booth 610-1. We would love to talk to you about your project! New Client In Production: Henry's Collision Center! Henry's Collision Center is an auto body repair shop in business in Manchester, NH since 1927. The firm focuses on high quality auto body repairs at a fair price. Create a more eye catching site. Emphasize the firm's longevity and warranty program. Emphasize the firm's dedication to continuous training for their technicians. Showcase the quality of the work the firm does by depicting the repair process from start to finish. Create an on-line review mechanism on the new site. Use Search Engine Optimization (SEO) techniques to increase traffic to the site and drive sales. Monitor and measure the traffic on site. Check out this project and the rest of our web design portfolio. New Client in production: BestEnergyMonitor.com! Cairn is thrilled to announce the launch of another client project. Welcome BestEnergyMonitor.com. This Colorado based firm provides energy monitoring services and energy monitoring products. The project features some neat new tools including the myContact message capture and filtering system and a data base driven tool examines the always on or phantom electrical loads in your home. Many thanks to bestenerygymonitor.com for your business and welcome to the Cairn Applications portfolio. Cairn Applications now offers Web Card, a simple low cost web site solution. This one page site is packed with features. The Web Card is a great, low cost solution to get your business on the web. Click here for more information on Web Card. James Moser of Cairn Applications gave a presentation to the Merrimack Valley Chapter of SCORE ( the Senior Corps of Retired Executives) this morning entitled Internet Marketing 101. The presentaion goes through the process of making your way out on to the web, and highlights a number of issues for the uninnitiated. The presentation is reproduced here. Many thanks to SCORE for the this opportunity! The Cafe Indigo Project is live in production! This was an awesome project. It features a beautiful design, an Ecommerce integration through goEmerchant.com, and a Google maps integration! The project includes a number of myCairnApps tools including mySiteSearch, myBlog, and myContacts with the new mailing list feature that integrates to myBlog. Box Tracker, for those of you that do not know, is an application that was written by the NH Web Developer in my previous company, LRA Solutions. Box Tracker is a container tracking tool for the waste hauling industry. It serves the small to mid-sized waste hauler as a container tracking, customer management, automated billing, and dump facility management tool. The application was built with Visual Basic 6.0 and a Microsoft Access Back end. Reporting and printable output was handled using the COM ( Component Object Model ) interface with MS Excel and MS Word. Unfortunately, Windows 7 no longer supports Visual Basic, the underlying technology, for Box Tracker. Microsoft prefers, rather, to force developers to upgrade to their latest framework .Net at substantial cost. Microsoft's abandonment of Visual Basic is one of the many reasons that the NH Web Developer has abandoned Microsoft. But you know what technology is available on all platforms? That's right, it's the web browser. By building applications that run on the web, the operating system becomes irrelevant. The only things that matter now are internet connection and the browser. There has to be an operating system to support the browser, but it doesn't matter if it's Windows or Mac or Linux or anything else. So we are rebuilding Box Tracker to run on the web. This is the cutting edge of Web Applications: custom software for small to mid-sized companies based on the cloud computing model. This is software that is available from any computer anywhere in the world 24 hours a day. So the NH Web Developer is pleased to announce that Box Tracker has moved to the cloud. Call today for a demonstration. We are very excited to announce that we just signed Cafe Indigo of Concord, New Hampshire as a new client! Operated by Patti Dann, Cafe Indigo is a Concord, NH commercial bakery specializing in high quality vegan desserts and treats. The product line includes cakes, cookies , breads, cinnamon rolls and the very best carrot I have ever had! The firm also sells a cookbook of favorite recipes. Cafe Indigo's products can be purchased locally at 128 H Street in Concord, and nationally in Whole Foods Market. The new site will launch in January. Cairn Applications and the New Hampshire Web Developer are thrilled to announce the launch a new web site for ATA Martials Arts of Southern New Hampshire. studio with locations in Bedford, NH and Derry, NH. The project utilizes several site integrated tools buily by Cairn Applications including myBlog, myBulletin, myPhoto, and myContact. Check out our portfolio to explore this and other Cairn Applications projects. Cairn Applications, LLC has moved to a suite across the hall from our old offices at one Chestnut Street. This new space will make a better long term home for the New Hampshire Web Developer. Come see us at One Chestnut Street, Nashua, NH! The New Hampshire Web Developer is thrilled to announce the launch of a new client site! The New Hampshire Web Developer is pleased to announce the first release of myBulletin, a site integrated bulletin board exclusively for Cairn Applications' clients. Great for short term announcements, or for promoting specials or special events, myBulletin posts feature an expiration date that automatically removes each bulletin at a pre-set time! You don't even have to remember to go back in and remove the bulletins. This picture from the Tri-City Expo shows the New Hampshire Web Developer in conversation with a show attendee. The picture was taken by Michelle Palys of Photo66.com. Photo66 provides on location photography. Thanks, Michelle, for the picture! Wow...Great Event. Thanks to all the folks that stopped by our booth at the Tri City Expo on Thursday. Thanks also to everyone who participated in our grocery survey! There will be a lot of follow up conversations next week. 3 months free for Tri-City Expo attendees! Thursday September 22, 2011 Cairn Applications, LLC will be exhibiting at the Tri-City Expo, being held at the Center of NH Expo Center in the Manchester Radisson Hotel. The event runs from 3pm to 7pm and Cairn Applications will be ast booth 610. If you sign up for a web site at the show you will get 3 months maintenance for free! Click here for more information on what is included. Stop by and meet the New Hampshire Web Developer at Booth 610! The NH Web Developer is thrilled to announce that we are now settled in our new office at One Chestnut Street Suite #322, Nashua, NH 03060! We signed a lease and moved in on September 1 this year. The building is on the rotary accross from the Nashua District Court House and we occupy a small space (suite 322) on the 3rd floor. If you are in the area and you need a web site or web application then drop by! You will see the Cairn Applications app mobile parked out front!